The 2018-19 NHL season has officially begun. However, it does give another day to reflect on training camp, the preseason games, as well as some other tidbits thrown in. The biggest surprise coming out of camp is the emergence of Jusso Riikola. 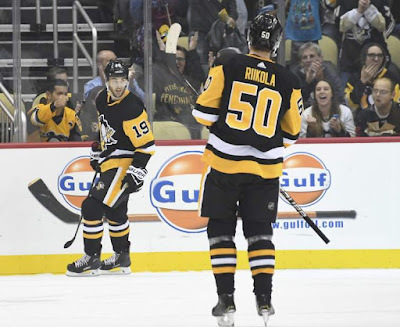 Head Coach Mike Sullivan admitted he had "no pre-conceived notions" about the young Finnish defenseman which allowed Riikola to show what he can do for the team without to live up to any sort of expectation. He could "just play." To put it plainly, he is all over the ice. He can defend the net, he can throw a mean check, and did I mention he can score? He preformed better than anyone could have expected in the preseason even with his unfamiliarity with American ice rinks. It puts the Penguins in an interesting situation: is he good enough to stay on the main roster as a seventh defensemen (replacing Chad Ruhwedel) or should he spend some time in the minors to get more accustomed to American ice? With Brian Dumoulin a game time decision for the home/ season opener on Thursday October 4th, Riikola could get the opportunity to, as they say, "put up or shut up" against quite the foreboding foe: the defending Stanley Cup campions, the Washington Capitals. Dominik Simon was not a name on anyone's radar that the club would keep on the main roster. He didn't really raise any eyebrows during his time in Pittsburgh in the latter half of last season, however had a great camp and found some serious chemistry playing on a third line with Derrick Brassard and Bryan Rust. When you have Sidney Crosby pulling for you and calling you one of the "top five hockey minds on the team", it gives a guy a bit of a boost in confidence. We are all hoping that chemistry and confidence continues. Speaking of confidence, can we talk about the ageless wonder that is Matt Cullen? At 41 years of age, the man is still showing that he has what it takes to be a factor within the NHL. He still has the speed, he still has the hands, and, most importantly, he has the respect of everyone in the locker room. Cullen's leadership will be key factor in helping to guide the youngsters on the team as well as act as an authoritative figure when/ if times get rough. Daniel Sprong can and will surely benefit from Cullen's experience. After being sent down to the Penguins AHL affiliate in Wilkes Barre last season, it seems Sprong has, for now, earned himself a spot on the Penguins fourth line. His camp was not as some expected as he continued to be corrected for mistakes that landed him in WBS last season. He garnered no goals and only assist in preseason game action with only 7 total shots on net. He continues to struggle defensively as well as through the neutral zone. As of now, Sprong is questionable to play in the season home opener due to an injury that has his listed as "day-to-day." These are just a few talking points surrounding the end of Camp Sullivan 2018 and the beginning of yet another action packed season. Between these are other various talking points (such as a looming decision on a back up goalie situation), the first month or so of the season will give the Penguins faithful fanbase much to discuss and tweet about. and the Capitals Stanley Cup ring is ugly.